For any public transport operator, the visible cleanliness of train carriages is vital. The vast majority of the public consider that the cleanliness of train transportation has a more direct or immediate impact on customer's measurement of efficiency of the service or operator than anything else. Increased inter-franchise competition and reassuring increases in the number of passengers carried have together given the rail industry greater public exposure, an undoubted marketing plus. If people admire what they see then the public's visual expectations are realised. Today's high cost, high quality carriages must have the best wash treatments in terms of thorough cleanliness of roofs, extremities and recesses, the avoidance of damage, the colour preservation and protection, fast through-putting, equipment reliability and maximum uptime and the economy in operations. 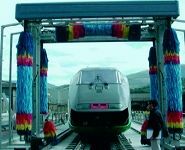 However, recent train designers have replaced conventional, fixed- configuration carriage washes and so universal wash systems are not suitable and therefore bespoke and specialist systems are often needed. 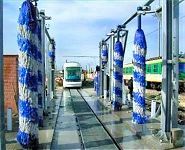 Our engineers are well established in the train washing market and use their knowledge and expertise of cleaning to produce designs that offer high performance, long life, good reliability and low maintenance. Back up service and after sales care form an essential part of this structure. Bespoke train and carriage wash facilities are widely used by train operators to keep the trains up to the cleanliness standards expected by travelling customers. A wide variety of systems have been installed in many countries and environments over Europe and America, with design and innovation constantly evolving. Bespoke systems are widely used due to no 'universal' train design, unlike trains and carriages of yester-year. Projects include those installed at Railcorp Sydney Australia, LN&WR Crewe, LOROL Willesden London, Network Rail Tyseley Birmingham, Deutsche Bahn Munich, Athens Metro Athens Greece, RAJA Passenger Trains Iran, Irish Rail Drogheda, COFMOW India as well as Scottish, Welsh and many other UK based operators. Agents and distributors have been at the forefront of this specialist technology, developing alongside the rail industry and more recently directly with the train operating companies themselves. The bespoke solutions, built to individual customer's needs, are based on proven standard equipment designs, and provide customers with consistently clean trains both reliably and economically. Systems utilise both Drive Through or Travelling Gantry Roll-Over methods. A full range of carriage and train wash systems are available to suit all customers, whether the project is for external body or underframe cleaning. Many carriage wash ranges are built as a bespoke system and include options of high pressure jets, spinners, rollers, custom-angled brushes, roof and skirt wash combinations, underframe washing, chemical / pre-soak systems, processor controlled packages and water recycling - all of which can be selectively combined to provide a comprehensive external train wash for any train carriage, regardless of length and throughput.